24/05/2013�� I think a WR250R is an EXCELLENT first bike for someone who fits it, and your 6'1" stature qualifies. It's an easy bike to ride, well proven reliability, enough power to get around, but not so much that you get into too much trouble. They also have excellent resale for when/if you want to make a change. You basically can't go wrong with the WR250R for your first bike.... Introduction. If it is to make a short, but still proper introduction for the 2010 Yamaha WR250R, I would call it an off-road motorcycle with a headlight and mirrors. 16/02/2014�� Make sure not to scratch the forks! With the dust seals out, you can now see the retainer ring. Remove that as well. You can now hold the outer fork and carefully pull the inner fork tube out. It won't be easy, but it will work. This will also remove the oil seal. I ended up using the inner tube to drive the seal out, and it took only a few quick pulls.... 16/02/2014�� Make sure not to scratch the forks! With the dust seals out, you can now see the retainer ring. Remove that as well. You can now hold the outer fork and carefully pull the inner fork tube out. It won't be easy, but it will work. This will also remove the oil seal. I ended up using the inner tube to drive the seal out, and it took only a few quick pulls. Make sure you replace the filter with the outside surface facing out, so as to avoid drawing any dirt still in the filter into the engine. If the filter appears to be damaged in any way, specifically rips, abrasion or thin spots, replace it. Even with the lower gearing, the KLX takes a little work to get the front end up in the air. Otherwise, the little bike has really good manners in the dirt at reasonable trail speeds. 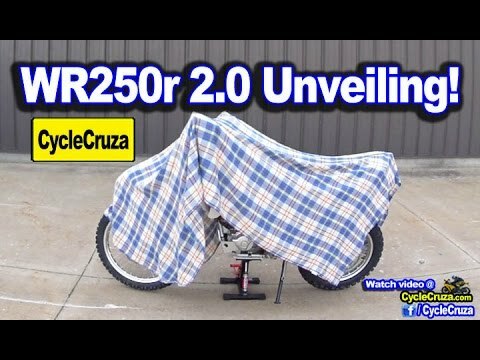 23/10/2017�� This fellow has taken his WR250R on several long dual sport adventures and racked up nearly 30,000 trouble free miles: 2008WR250R probably a better website for your needs since he limited himself to very practical modifications for long distance dual sport riding rather than dumping a lot of time and money into trying to make a slow bike go fast.